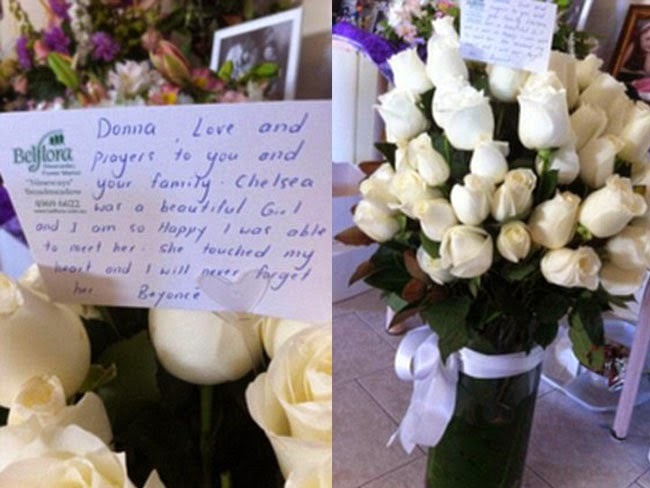 Proving she’s more than just your favourite pop star, Beyoncé has paid tribute to one of her biggest fans just days after her tragic death, sending 90 white roses and a touching note to her grieving family. 15-year-old Chelsea Lee James, who was first diagnosed with cancer ten years ago, made headlines when Beyoncé pulled her on stage during her 2009 concert in Sydney. Bey serenaded then 11-year-old Chelsea with her hit Halo, which brought the young girl to tears. The two crossed paths again last November, when Camp Quality a children’s cancer charity arranged a backstage meet-and-greet with Beyoncé while she was on the Australian leg of her Mrs Carter Show World Tour series. After ten years fighting the disease, the brave teen passed away at John Hunter Children’s hospital in Newcastle on Easter Monday, after spending Easter Sunday at Crowne Plaza enjoying one-on-one time with her beloved mum. Her encounter with Chelsea wasn’t the only time Beyoncé has reached out to fans who’ve been struck by tragedy. She paired up with the Make A Wish foundation last year to grant a wish to 12-year-old Taylon James, who suffers from a rare form of bone cancer and has an inoperable brain tumour. Taylon was invited to the Las Vegas show of the Mrs. Carter Show World Tour, and scored a seat front row. As Beyoncé descended from the ceiling in a harness, she landed right in front of Taylon, gave her a hug and kiss, and soon pulled her up on stage to join her singing and dancing during Survivor.